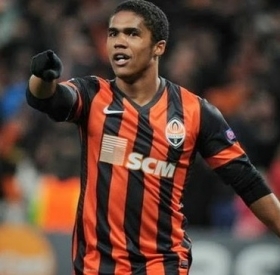 Tottenham Hotspur have reportedly joined the likes of Paris Saint-Germain and Manchester United in the pursuit of Juventus' Douglas Costa ahead of the summer. Manchester United have reportedly made a formal offer to prise away Douglas Costa from Juventus during the upcoming winter transfer window. Italian champions Juventus are reportedly planning to reunite Real Madrid attacker James Rodriguez with his former clubmate Cristiano Ronaldo. Romelu Lukaku has hinted that he would one day like a move to Italian champions Juventus. The Belgian striker, currently at Man Utd, has had a difficult start to the season scoring only 4 goals in 11 games. Premier League giants Manchester United are interested in signing Juventus forward Douglas Costa, reports SportsMediaset. Colombian international forward James Rodriguez, who set the world on fire during the World Cup in Brazil in 2014, has agreed a permanent transfer from Real Madrid to Bayern Munich. The player struggled during his time in La Liga but seems to have reversed his fortunes since making a move to the Bundesliga. Blaise Matuidi will make the move to the Italian champions from French club Paris Saint Germain for a surprisingly low fee of £18.2 million, before added performance and signing-on bonuses. Juventus have completed a deal to sign 23-year-old Italian intenrational forward Federico Bernandesci for around £35 million including add-ons. The player arrives at the Old Lady from Serie A rivals Fiorentina. After much speculation, Douglas Costa has finally signed for Italian club Juventus and will complete his medical this week before being officially unveiled. Inter Milan are ready to replicate their neighbours AC Milan's dealings in the transfer market and go on a spending spree, starting with Liverpool's Mane and Marseille's Thauvin. Czech Republic international striker Patrik Schick is to seal a deal to join Juventus from Serie A rivals Sampdoria. The forward will sign a five-year contract in Turin. Serie A holders Juventus have emerged as surprise contenders to pursue the signature of wantaway Leicester City winger Riyad Mahrez this summer. Robert Lewandowski was extremely vocal about his teammates and the lack of help he received in the last few games of the Bundesliga which denied him the top scorer award.